I love what Saree does to a woman’s look and any woman can carry it off, if draped perfectly! It hugs at the right places, hides your flaws, accentuates your curves and makes you look glamourous in minutes. We all saw Aishwarya Rai at the Cannes 2013 adorned in a Golden Saree. Its time that we introduce this Indian Ethnicwear to the World. 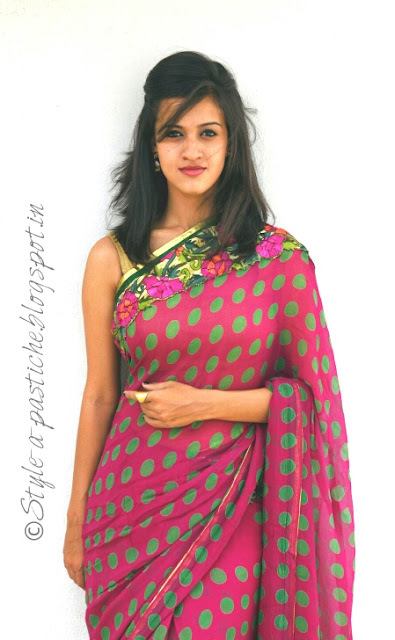 In this post I’ve styled my S-I-L in a saree.. Doesn’t she look Fab!! This Silk Chiffon Saree has a modern twist to it with Polka Dots and the Zari in Gold with a Floral Embroidery, accessorized it with a Yellow Tear Drop Earring and a simple Gold Ring so that all the attention is on the Saree. Previous Post Previous post:Simple and Punk! I totally agree… sari is so elegant and brings out the best in every woman who wears it! Absolutely STUNNING! The combination of prints & beautiful colors & rich, luxurious fabrics is just beautiful. You look amazing! I always wanted to own a saree! Maybe because of all the books I’ve read about India and the Indian culture! I am definitely going to buy one the moment my path leads me to place where they are sold – kinda hard now that I live in Zagreb but you never know… and then the next thing would be to get someone to teach me how to wear it properly! Great post Love from a GiG blogger!! Her hair is so perfect 🙂 Sarees are really feminine. Love them. So much of gorgeousness !! I love that saree so gorgeous! Thank yo all for all your love!